Pure URL is a free browser extension for all recent versions of Firefox and Google Chrome -- and likely also Firefox-based and Chrome-based browsers like Pale Moon or Opera -- that removes optional parameters from URLs automatically. Optional URL parameters, like utm_source, yclid, fb_ref or ref_ are a common occurrence on the Internet. Most, if not all of them, are used for tracking purposes and of no use to Internet users. While they may be useful to webmasters and marketers, Internet users may want to get rid of them as they don't offer any benefit, may make the URL harder to read, and extend the URL when it is shared or used in blog posts. Pure URL has been designed to take care of several common forms of optional URL parameters that users may encounter on the Internet. The add-on works automatically, stripping optional URL parameters that it supports from the browser's address bar automatically. 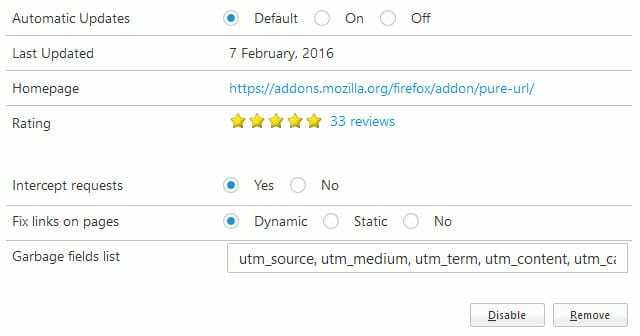 You may add, remove or modify individual parameters in the extensions' settings in Firefox (The Google Chrome version does not support this at the moment). There you find listed the "garbage fields list", an editable field that you can use to add or modify entries in. This can be useful in several occasions. First, if you are a webmaster and need specific parameters to be active, then you can remove them from being stripped from sites you visit in Firefox. Second, if you encounter URL parameters that are not included, you may add them so that the extension removes them from URLs as well. The settings in Firefox provide two additional options that are unfortunately not explained anywhere. Intercept requests is set to "yes" by default, and setting it to "no" appears to turn off the extension's URL parameter removal capabilities. Fix links on pages on the other hand defines if links found on websites visited in the browser are fixed automatically. It is unclear how the dynamic and fixed values differ from each other though. Pure URL is a handy browser extensions for Firefox and Chrome that removes garbage from URLs automatically. The Firefox version of application is superior currently as it allows users to add or remove parameters, and make other modifications which the Chrome version does not support at the moment. This is a nice one. I’ve added to the add-on’s present default “garbage fields” : gfe_rd, ei, gws_rd which all three are concatenated to the user’s Google search query when performed from Google’s home-page (which I never use by the way) and the result page came out “pure” (not too fond of the word, “clean” would be enough), with only the q=[my search] … lovely, and that’s for Google alone, think of all the possibilities Web wide, of all the url garbage removable easily. How did you add to the addon’s default settings? As far as I could tell the addon is not configurable. TL;DR: If anybody has been using Un-UTM like me, switch now to PureURL. This method is waaaayyyy superior. For the last 5 years I’ve been using the Un-UTM userscript with Greasemonkey in FF. 3rd – reloads the page with the stripped URL. While this is useful if you want to bookmark pages you’ve opened with a clean URL, the problem is you are still pinging the tracking URL once and double loading the page to get to the cleaned URL. I just tested PureURL to see if it did the same thing and I’m happy to report that it works much better than that. It’s smart enough to strip the garbage parameters from links BEFORE you click on them so there’s no pinging & no double loading. It seems all the links are “pure” before you click on them. Thanks for sharing that, I just assumed it would strip away the info before pinging and never considered there was a possibility that it was just for cosmetics. Was looking all over online to see if it did. How did you test it? (Sorry, I am noob). If you’re referring to the ‘Clean Links’ add-on for Firefox, that add-on already has a similar functionality accessible on its Option page > ‘Remove from links’ section. It works nice but is a bit tougher to setup (better to know regexp syntax to use it easily). I removed ‘Clean Links’ because it needs an update, as odd results appear here and there. Unfortunately because it is IMO the best link redirection cleaner I know available as a Firefox add-on. I used this Plug-in some time back but can’t recall why I removed it. Probably bugs, but will give it another try. Thanks Martin. Personally, this could be not that company friendly. Example, if a user was using an affiliate related service, then the member would probably not be able to get his or her commission. As for the right to privacy, VPN + Private Browsing + CCleaner is enough to secure one’s sensitive stuff. Looks like a handy idea. However does it need to be linked to a central database to maintain an effective list of rubbish params? Perhaps in a future version? A lot of users would have an anti-malware URL scanner added to that. Ideally I’d like to add a user-scripting tool to rebuild pages that are poorly authored. The amount of processor cycles required to use the innernets seems to be growing markedly.